A Friendly Reminder, From Me to You.. This post is a friendly reminder from me to you. This 'shameless' exposure is quiet embarrassing to be honest, but I have to deal with it. I just woke up like 15-30 minutes ago. I went straight from my bed to my laptop on my desk, and found that I have 14 new mails. You know what, one of those is a message from Blogger titled "http://memoriesofsaturday.blogspot.com/ - ACTION REQUIRED" (for those of you who didn't know, Memories of Saturday is my Photoblog). Okay, I'll show you the message. Click on the image for larger view. 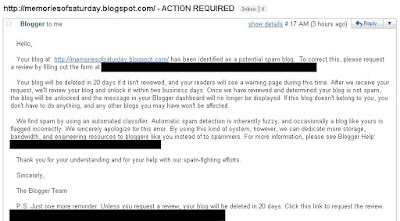 In this case, Blogspot has informed me that they're using automatic spam detection, so some blogs are flagged incorrectly. However, as you might have known, EVERYBODY who reads your blog(s) CAN flag you. What's more disgusting? I have realized that everybody, even the strangers, actually get to know you, your life, the other people in your life, via your blog. Maybe, this is a risk that you have to accept when you decided to blog your life, your thoughts, or whatevs.